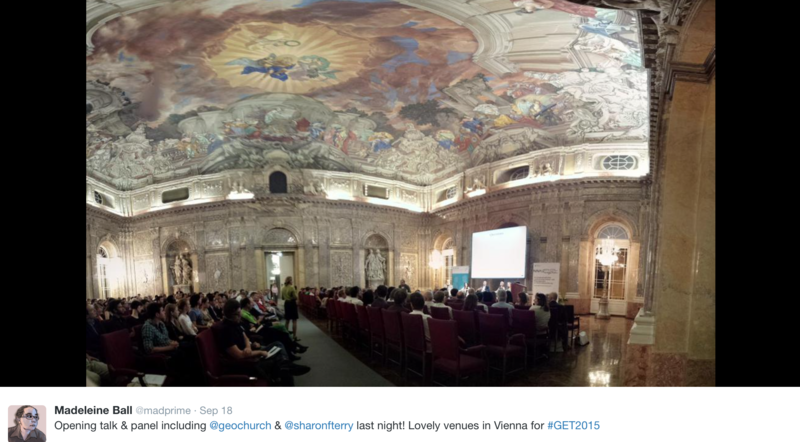 This weekend the Centre for Molecular Medicine (CeMM) in Vienna was buzzing with Genomes, Environments and Traits – in other words: the annual international GET conference took place this weekend. Populations: What are examples of mega-cohort studies? Environments: What approaches can help us measure important environmental influences? Traits: How can technology help improve the capture of traits of cohort participants? Society: What does it mean for society when genomic information becomes more broadly available? Technology: Which technologies will be the next drivers of biomedical research and precision medicine? In his festive lecture opening the conference, George Church started out by asking the hardest question: “Is genetic testing useful today?” And he stated his own answer by giving several examples, e.g. of how genetic testing has virtually eliminated Tay-Sachs disease by pre-conception testing and counselling, how the Beery twins were diagnosed and successfully treated, and the so-called “Angelina effect” when Angelina Jolie chose for a double mastectomy as a result of genetic counselling when she discovered she was a carrier of the BRCA1 mutation that gives an estimated 87% risk of developing breast cancer. In short: genetic testing IS useful today, however there is still a lot of potential for further health benefits, which was the topic for the rest of the conference. The lecture by George Church sparked the discussion about how some people are afraid of sharing their genome data but seem unable to distinguish between the genome being a unique identifier and at the same time is not a deterministic soothsayer about health and disease. Sharon Terry spoke the voice of the patients as representative of Genetic Alliance when she said: “A lot of focus is on privacy, but we should be more interested in control – then patients would be happy to share”. In the flash talks as well as in the session on society chaired by Barbara Prainsack, we were presented with amazing patient stories from patients who not only want their data to be shared but also want to have access to their own data so they can act on it. Dr. Corrie Painter told us her story on how social media can help drive research on rare genetic disease and Steven Keating showed us how he – as a patient scientist – obtained his own brain scan data and used it to both drive his treatment and engage the scientific and patient communities. The flood of discussions on Twitter speak for themselves. I also learnt a lot! Eagle Symposium: Bigger Than Data – Discover or Die?